CRM software is essential, but how can you be sure? Often businesses are bombarded by products, solutions and campaigns highlighting different business needs. Therefore deciphering what is relevant can often be a difficult task for organizations. CRM software is one business solution that cannot be ignored. In the case of customer relationship management knowledge is power. The argument ‘what you don’t know won’t hurt you’ couldn’t be less relevant in the world of business. Knowledge transfer can occur within seconds and the speed at which you are able to deal with customer requests can be the difference between customer retention and a sales loss. The question then arises how can you best manage your customer needs and the day to day running of your business? The only way to do this effectively is through the implementation of an online CRM software system. Online CRM software is the way forward. Previously sales teams have had to manage their interactions with clients through maintaining excel sheets, word documents or even recording data in soft copy documents. Ensuring that customer data is correct and up to date is close to impossible when these documents are being maintained manually. However an online CRM software package can automatically reduce the time spent documenting customer data. Through the implementation of CRM systems, companies can effectively manage their sales teams and develop strategies relating to their key clients. CRM software packages enable the users to view their sales pipeline with greater clarity. The benefits of this are unparalleled; customer knowledge is the key to developing and maintaining growth. An intuitive, online CRM software solution streamlines the front office business processes that directly impact sales execution and customer service. 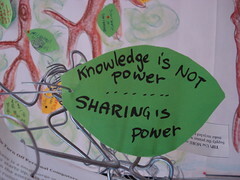 Image “sharing is power” by IAALD Editor on Flickr under Creative Commons license. ← Why Buy CRM Software?